Opportunity caught this view of Martian clouds over Endurance Crater at 9:30 a.m. (Mars time) on Nov. 16, 2004, its 290th mission day. Similar to cirrus clouds on Earth, these clouds are part of a band that forms near the equator when Mars is near the part of its orbit that is farthest from the sun. Scientists have created Mars-like clouds in a former nuclear reactor here on Earth. Clouds formed under Mars atmosphere conditions in a three-story-tall chamber in Germany after researchers cranked up the humidity to 190 percent — nearly double the threshold required for clouds on our own planet. "A lot of atmospheric models for Mars are very simple," lead author Dan Cziczo, an atmospheric chemistry professor at the Massachusetts Institute of Technology, said in a statement. "They have to make gross assumptions about how clouds form: As soon as it hits 100 percent humidity, boom, you get a cloud to form. But we found you need more to kick-start the process." NASA's Opportunity rover was the first to spot high-altitude wispy clouds on Mars in 2004. 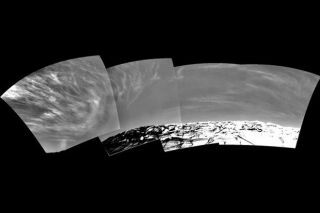 From the rover's vantage point in Meridiani Planum, the clouds looked surprisingly like cirrus clouds on Earth and were likely made up of water ice, researchers said at the time. Cziczo's team hoped to better understand the conditions under which such clouds come to be. Most of the experiments took place in a former nuclear reactor in Karlsruhe, Germany that is now used as the world's largest cloud chamber. The facility, called the Aerosol Interaction and Dynamics in the Atmosphere (AIDA), has only done simulations of Earth environments before. To make the chamber more Mars-centric, Cziczo's team removed all the oxygen from the chamber and replaced it with nitrogen and carbon dioxide, which make up most of the Red Planet's atmosphere. Because Mars is extremely dusty, they added particles that are similar in size and makeup to those found on the Red Planet. The dust is important because, as on Earth, water vapor gloms onto these particles and forms clouds. As a control, the researchers moved the temperature dial down to minus 81 degrees Fahrenheit (minus 63 Celsius), which is the coldest temperature at which clouds occur on Earth. They were able to form clouds under Earth's climate conditions. Gradually, the researchers then moved the temperatures to a low of minus 120 Fahrenheit (minus 84 Celsius) — a balmy summer day on Mars. The team created 10 Martian-like clouds in a week of experiments, analyzing the clouds' composition, numbers and size with laser beams that scattered within the cloud. They then performed six months of analysis, during which they uncovered the need for Martian clouds to have high humidity. No one knows why such high humidity is the crucial ingredient, but it's a ripe area for further study. The cloud chamber will soon be renovated to accommodate colder temperatures that are more representative of Mars conditions. Cziczo said he hopes to start new experiments next fall. Results from the study were reported in a recent issue of the Journal of Geophysical Research: Planets.